Where FruitLook provides satellite imagery to local farmers, our FruitLook Team are our feet on the ground. For training, on-farm support, development of new services based on FruitLook data, research opportunities and any other ideas or questions you might have we are available to assist you! Annaline Smith basically grew up in the orchard. Her father who was an agricultural researcher nurtured her love and interest for plants as well as the effect of climate and stress on their growth and physiology. Annaline has a BSc (Agric) in Plant production and breeding (Horticulture and Genetics) from the University of Stellenbosch. She is currently in the process of finishing her MSc (Agric) in Horticulture. From 2012-2017 she was a lecturer in Pomology and Horticulture at Elsenburg Agricultural Training Institute. Annaline will focus on FruitLook training. She can be contacted via email on annaline@ fruitlook.co.za, or on her mobile, 066 212 2211. Roan Naudé was born and raised on a wine farm in Worcester. This is where his interest in farming and irrigation began. Later on, he assisted at a cellar during harvest season to get a better understanding of the wine production process. With his farm background, he views FruitLook as an important tool to farmers to determine where to prioritize farm management actions to attain the maximum amount of produce per hectare. Roan will focus on on-farm support in the usage of FruitLook and will assist with the FruitLook training sessions. Roan can be reached via roan@ fruitlook.co.za, or on 066 225 5106. Caren Jarmain has been with FruitLook since the start. She has a PhD in Agrometeorology from the University of Natal (2003). She has studied vegetation water use for almost 20 years and is passionate about translating research to pratical application and technology transfer. 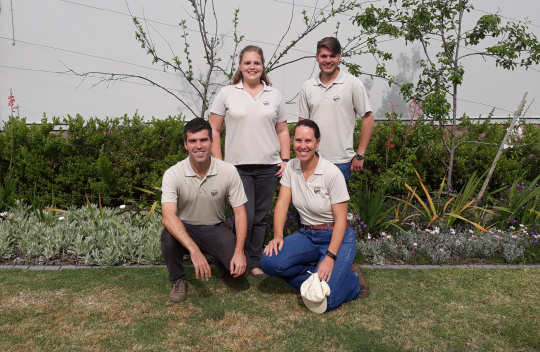 Caren manages the South African part of FruitLook, including training, data accuracy evaluations and investigating future application of the FruitLook data (e.g. yield estimations). Caren is based in Stellenbosch and works as Independent researcher. She is a Research Associate at the Centre for Geographical Analysis (CGA) at Stellenbosch University. Caren can be contacted via cjarmain@ gmail.com. eLEAF (www.eleaf.com) is a Dutch high-tech company that pioneers in operational satellite based solutions. eLEAF data products are used to assess land and water productivity for sustainable agricultural and water management practices worldwide. The ambition is to become the global reference for operational and reliable high quality data on crop growth and water use. eLEAF provides the FruitLook data products and FruitLook portal and works in close cooperation with the South African FruitLook Team. eLEAF is represented by Ruben Goudriaan. Ruben has been involved in FruitLook over the last 5 seasons and manages the Dutch side of the cooperation. He has a MSc in Physical Geography and BSc in Earth Sciences from Utrecht University. Apart from FruitLook, he is involved in various other projects in South Africa related to agriculture and water management. He is available via ruben.goudriaan@ eleaf.com.